Home » Editorial » PARALLEL UNIVERSE: Why Didn't Obama Have His 'Darth Vader' Bus Built in His Home Town? In addition to picking on President Barack Obama for choosing to spend his summer vacation later this month in posh Martha's Vineyard, Republicans and others are blasting him for going to Canada for the $1.1 million motor coach he's been using in his just concluded Midwest tour. The bus is a product of the Prevost (pronounced Pray-Vo) company, based in the province of Quebec. Prevost makes tour buses and customized coaches that are favorites of rock stars. The company says it built the "shell," which I interpret to mean the basic bus, with the interior completed in Tennessee (at least they didn't go to Tijuana for a bargain upholstery job!) Typically, engines and transmissions are chosen by the end user of the coach and America is a major producer of these (Detroit Diesel and Cummins, for example). Actually, according to news accounts I've read, there are two of the black painted, tinted window behemoths, for a total of $2.2 million. The buses were commissioned by the Secret Service and one of them will be used by the Republican nominee in next year's campaign. 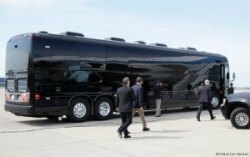 http://abcnews.go.com/Politics/obama-tour-bus-made-america/story?id=14324892) MCI is the sole surviving U.S. motor coach manufacturer. The news story misspelled Schaumburg, leaving out the first "u". Another major coach manufacturer, Flxible of Loudonville, OH, transferred its manufacturing to China in the 1990s The company was founded in 1913 as the Flxible Side Car Co. to make motorcycle sidecars. According to ABC News, the U.S. Secret Service said it purchased the vehicled from Hemphill Brothers Coach Co.,Nashville, Tenn.
Hemphill, which declined to discuss the presidential bus or its business generally, assembles custom motor coaches and customizes the interiors before selling the finished product directly to individuals, businesses or the government. "We just make the shell. We don't know anything about the end user," said Christine Garant of Prevost. Several industry sources speculated that Hemphill may have installed an American-made engine, such as a Detroit Diesel, in the presidential bus, though that could not be immediately confirmed, according to ABC. Secret Service spokesman Ed Donovan said the agency based its purchase on bus design, looking for the coach with the most available space to accommodate state-of-the-art custom security modifications. Prevost makes excellent buses. In December 2007 I rode in a Prevost bus from Beckley WV to New York City, so Obama and I have something in common. It was a wonderful ride in a bus driven by John Brakefield, who owns Coal Country Charter, a Raleigh County, WV bus charter business. Link: http://archives.huntingtonnews.net/columns/071206-kinchen-redeyetour.html.